Maximise revenue with the right fundraising strategy, prospect identification, and plans prepared by our experienced consultants in Education, Health, Arts & Culture and Community sectors. Strategies are based on research, extensive experience with donors, and tailored to your organisation’s unique challenges and opportunities. All services from brief review to full campaign planning. We have built a strong reputation for quality, research-based fundraising advice, with more than 500 clients since 2004. With our assistance, they have raised more than $500million for their important work. With fundraising consultants and associates based in Sydney, Melbourne, Brisbane, Perth, Auckland, Christchurch, Gold Coast, and Mackay, AskRIGHT is able to assist organisations throughout Australia and New Zealand. Aspire Non Profit Consulting offers bespoke solutions to improve direct marketing and fundraising programs, with an expert focus on lottery creation and management. Why Aspire is different The strength of Aspire, lies in a simple formula. At the centre of our operation is decades of inhouse industry experience of lottery and not for profit businesses. This, coupled with market leading suppliers and an emphasis on fantastic client relationships, leads to an unparalleled experience, which will ultimately improve your bottom line. Contact us today to discuss how we can deliver the results you aspire to. With creative agency and fundraising management experience, our copywriting services span the whole spectrum. Websites. Fundraising campaigns. Donor and partner engagement. Brand development. Recruitment. Whether you’re a small non-profit start-up or part of a big national charity, our freelance copywriters and creative directors will work with you one-on-one to get intimately acquainted with your brand and your cause. Only then can we help you tell the most compelling stories to move and motivate your supporters. Get in touch and ask us about consulting and copywriting rates for rebranding projects, website content, awareness or capital campaigns, impact updates, storytelling, eDMs or donor/partner/sponsor acquisition and retention. We can even create a perfectly pitched online ad for your next staff or volunteer recruitment drive. Cornucopia provides tailored, quality face-to-face and phone fundraising services for donor acquisition, retention and development for charities in Australia and New Zealand. Cornucopia has been a leader in charity fundraising since 2000 in Australia and 2003 in New Zealand. Our approach is to ensure that the connection between the donor and charity remains strong to maximise the Return on Investment from your fundraising program; in other words, we care about your cause. Cornucopia was the first agency in Australia to undertake welcome calling and decline management as part of our face-to-face regular giving campaigns and we understand the value of high quality telephone contact with donors. We offer tailored calling programs specific to your needs, from small highly targeted datasets through to large rolling acquisition campaigns. Talk to us about how we can help you achieve your fundraising aims across donor acquisition, retention and development. DTV are the global DRTV experts for the NFP sector. We specialise in three key areas – creative, response handling and media planning optimisation and analysis that generates a positive ROI. flat earth direct is an agency dedicated to fundraising and campaigning for good causes. flat earth direct is an agency dedicated to fundraising and campaigning for good causes. Quite simply we’re about digital fundraising, direct response and campaigning stuff that result in real, tangible outcomes. We created an agency that brings you the best people, not necessarily the closest. We call it the flat earth approach. Having worked all over the planet, we live and breathe the mantra that everything is different, yet everything is the same. There are more similarities in the way people behave than differences. That means we bring our insights and successes from our work around the world, you bring your passion, challenge and goals. And together we create the right solution. If any of this stuff or the bits and pieces on our site got you excited, we’d love to chat to you. FrontStream has raised over $300 million for Australian charities. Our platform supports large peer-to-peer events such as World’s Greatest Shave, online auctions and donor management. FrontStream (formerly known as Artez) is a leading provider of integrated online fundraising tools and we specialise in helping non-profits with their secure (Facebook integrated) donation pages, peer-to-peer fundraising (including mobile & Facebook), online auctions, regular giving donations, merchandise & e-ticket sales and CRM (donor management database). We work with some of the biggest charities in Australia and New Zealand including Guide Dogs, Cancer Council, Leukaemia Foundation, Fred Hollows Foundation, Mater Foundation and many others. Our mission at GiveTel is to assist our charity partners in achieving their goals by delivering the best quality fundraising calls in the industry. We began operations in 2011 with the aim of bringing a fresh approach to tele-fundraising in the Australian market, one centred around exceptional quality calls and first-class client service. Since then, we have been delivering a broad range of hugely successful tele-fundraising campaigns for our fabulous charity partners. The philosophy at GiveTel is simple. We strive to deliver the highest quality in all our interactions – whether on the phone with a valued supporter, in the office with colleagues, or working together with our clients. We know that by focusing on quality, we will deliver the best possible results. Huma Charity Challenge is powered by World Expeditions. Since 2013, it has organised 500+ fundraising adventures and fundraised over $5 million for charities across the globe – at no charge. Huma Charity Challenge is powered by the World Expeditions Travel Group, a pioneer in the adventure travel industry with 40+ years of experience. In 2013, it evolved into a division of the World Expeditions Travel Group to specialise in Charity Challenges. Since then, Huma Charity Challenge has organised more than 500 fundraising adventures at no charge for charities across the globe and fundraised over $5 million. Huma Charity Challenge is proud to help people and charities achieve their fundraising goals through sustainable, affordable and life-changing adventure travel. More Strategic works with fundraising and marketing teams to uncover insights, create great supporter experiences and develop effective strategies. Pareto Fundraising is a full service, direct marketing agency with a focus on understanding donor behaviour to help you deliver successful and strategic fundraising campaigns. What is the best way to acquire donors? Should we use online channels? Should I send our regular givers cash appeals? How do I ask our supporters for a bequest? We have the expertise and experience to help you find the right answer. We also have offices in Brisbane and NZ. Redstone Marketing was established to directly benefit the nonprofit industry. Sharing tried and true database and marketing techniques for individual donor fundraising – specialising in acquisition, retention, upgrades and reactivation. Robejohn is a fundraising marketing agency specialising in direct mail, data services and strategic planning. Our mission is to use creativity and data to achieve our clients’ fundraising goals. Robejohn uses skill and experience to develop and manage direct mail fundraising campaigns. We are proud to have worked with influential charities since 1987 both across Australia and internationally, creating engaging campaigns that drive direct response from donors. We use data driven strategies to create long term partnerships with donors for our clients and discover in-depth insights and apply unique approaches to create these successful fundraising campaigns. Uncover the potential of your database by understanding the giving habits of donors and develop strategic plans so you don’t miss out on major donations. Make your campaign cost effective and delivered on time with our production services. Robejohn loves working with clients to achieve changes in order to reach financial and communication goals. Unity4 are specialists inbound and outbound call management. We are especially successful converting contacts in to regular givers via our mature Agent team. We believe in the power of good conversations to do good for people and businesses. We operate one of the most advanced technology enabled agent services business. It’s defined by its workforce, all of whom operate from home. Unity4’s approach to work life balance attracts then retains great people with the acumen to deliver good conversations that deliver results. Our ability to connect with supporters and have a conversation rather than “parrot like” reading a script delivers superior results and increased average regular giver longevity. Great Conversations are supported by our cloud technology, Rapport. Rapport ensures we call people when they are available and receptive. Our call guide scripting tool guides the agent conversation to engage and gently convert prospects into supporters. 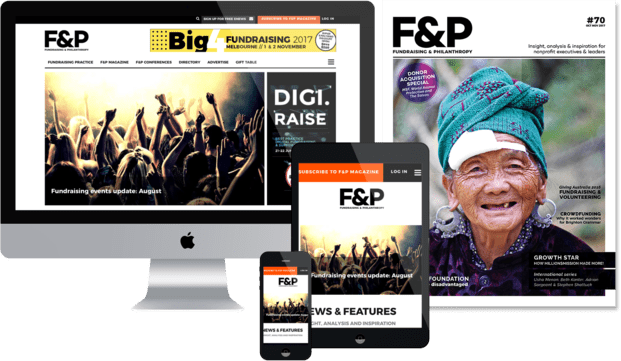 A specialist consultancy focussing on better face to face fundraising, with 20 years’ experience with agencies, charities and regulators to build and improve client programs. Face to face fundraising can transform a charity and inspire thousands of new donors to give for many years. It can also be a high risk and complex way to fundraise, requiring careful management to achieve the best long-term results. Paul Tavatgis, the Director of Whipbird Consulting brings more than 20 years’ experience of face to face fundraising to support clients. This includes experience with fundraising agencies, charities, boards and media and most recently as CEO of the peak body for F2F fundraising in Australia. If you are considering F2F for the first time, or looking at ways to improve your current program, Whipbird will help you build your capacity, knowledge and skills in face to face fundraising and help you achieve tangible, long-term gains.